MIMI AND DONA is a personal documentary about my aunt and grandmother. It is also a love story. I set out to make it in 2009, taking an HDV camera from Los Angeles to Dallas to capture the quirky and insular world of Mimi and Dona. Time was scarce. Mimi had finally admitted that she could no longer care for her daughter Dona, and my mother (Dona's sister) had submitted an application to move Dona to a state-run institution in Denton. After 64 years, Mimi would have an empty nest, and Dona would suddenly be on her own. Over the course of the summer, I shot Mimi and Dona's bickering and tenderness, their jaunts to the beauty parlor and McDonalds, and their near‐religious obsession with Wheel of Fortune. I also interviewed my mother and my brother, who voiced the ambivalence we were all feeling. Was this the right thing for Dona? Would Mimi fall apart without her? Back in Los Angeles, whenever I told people about Mimi and Dona's situation, they would chime in that they knew someone in the same predicament—a cousin, a neighbor or a friend's sibling, some with developmental disabilities, others with mental illnesses, all struggling to find appropriate care and housing for a loved one. This was an untold story happening all around us, with caregivers like my grandmother facing agonizing decisions, often with little support or guidance. Beautiful, heartfelt, and poignant. It shows the long-term impact of disability on families—and how disabilities touch so many families. I hope this film will inspire funding for additional housing alternatives and a decrease in the waiting lists. 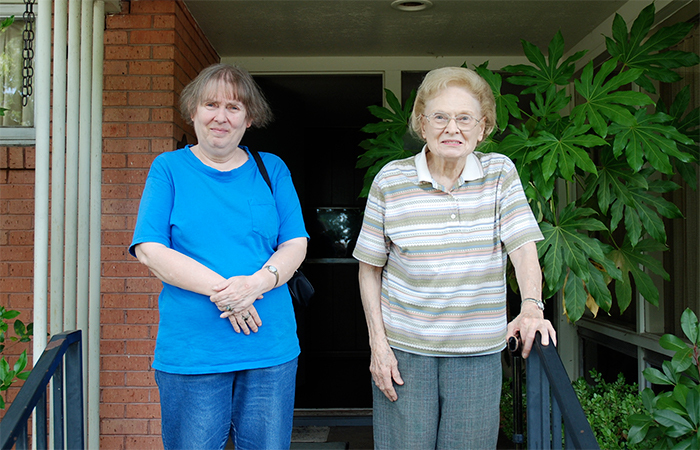 Since 2009, I have flown to Dallas eighteen times to document Mimi and Dona's story. I have gained new understanding and admiration of my mother as the sibling of person with a disability; she represents countless brothers and sisters who overcome difficult childhoods only to assume the responsibility of caring for their adult siblings. I have made discoveries about my childhood—why there was unspoken tension in the family and how it could be traced back to an unfortunate misunderstanding about my aunt Dona. I have also grown as a parent to my own children—in particular to my son who is on the autism spectrum—by witnessing the awe-inspiring love Mimi gave Dona her entire life. Important. It had me in every emotion from tears to anger to frustration.